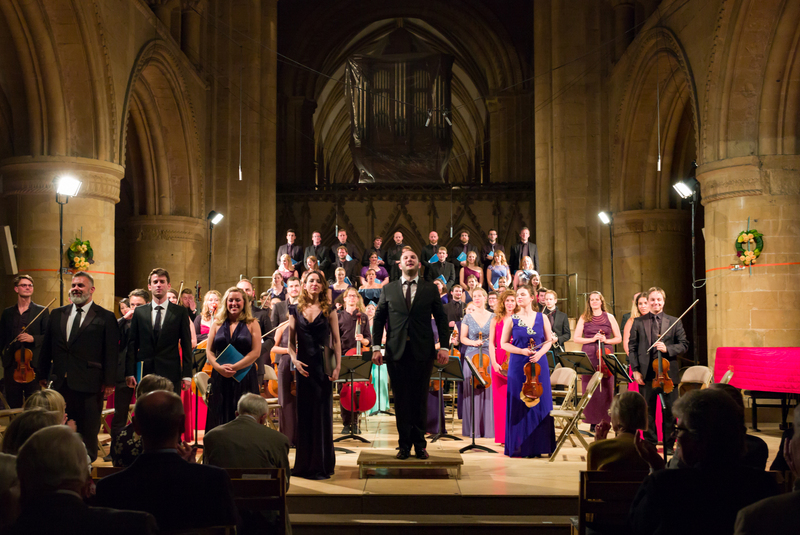 “Something exceptional happened in Southwell Minster on Saturday night. And it wasn’t just that the entire capacity audience rose as one at the end to give the performance of Mendelssohn’s Elijah the longest and most unanimous standing ovation I have experienced in 25 years of concert reviewing. That was how William Ruff opened his review in the Nottingham Post of the Festival performance on 29th August 2015. To end our series of highlights from last year’s festival we return to that performance for the third time. To read the complete review in the Nottingham Post please go here. To comment on our Twelve Days of Christmas celebration or on the Festival in general please email or join the conversation on Twitter. The 2016 Festival takes place from 25-29 August. The programme will be launched at a special concert on Friday 18th March at 7.30pm in Southwell Minster. The most memorable event of the 2015 Festival? Haydn’s Seven Last Words of Our Saviour on the Cross for string quartet was performed in Southwell Minster in a late night concert on Friday 28th August: the performance was given in the round and in almost total darkness beneath the central tower. The impact of the music is complemented by wonderful exterior views of the Minster and sight of a very special moon behind scurrying clouds. https://www.southwellmusicfestival.com/wp-content/uploads/2016/01/day11.jpg 479 842 Cheyney Kent https://www.southwellmusicfestival.com/wp-content/uploads/2016/08/southwell_music_avatar-295x300.jpg Cheyney Kent2016-01-05 09:30:022016-01-03 20:06:29The most memorable event of the 2015 Festival? Our tenth highlight from the 2015 Southwell Music Festival to celebrate the Twelve Days of Christmas is a single Schubert lied. One song – but what a gem. Schubert may not have excelled as an opera composer but in less than four minutes his setting of Goethe’s poem Ganymed brings a fragment of Greek myth vividly to life with all the drama of an operatic scena. Of course his ‘librettist’ – imagining the emotions of the youth Ganymede as he is seduced by Zeus through the beauty of Spring – was no slouch. And neither is Schubert whose piano part, in all its variety and orchestral colour, speaks with as much emotional weight as the sublime vocal line. This performance was given by tenor Nick Pritchard and pianist Libby Burgess as part of the Schubertiade in the State Chamber on 27th and 28th August. The Stage at the Old Theatre Deli is about as intimate a concert setting as you could get without inviting the performers into your front room. This lovely Georgian theatre in the centre of Southwell has become an integral part of the Southwell Music Festival since being called into use at the last minute in the run up to the first festival in 2014. On that occasion we crammed the players of the Mendelssohn Octet onto the stage for one of two exhilarating performances of the work that evening: the evidence of both is available here. In 2015 Festival organisers were slightly more modest in their ambitions – presenting Brahms’ string Sextet No.1. Today’s highlight for the Twelve Days of Christmas is the Scherzo and Trio from that performance. The players were Maria Włoszczowska and Natalie Klouda (violins), Simon Tandree and Ruth Nelson (violas) and Karel Bredenhorst and Ashok Klouda (cello). Sunday evening concerts at the Southwell Music Festival tend to challenge audiences with less familiar repertoire – or familiar music in an unfamiliar guise. In 2015, between two works already featured in this series of highlights – Stravinsky’s Octet and The Rite of Spring for four hands at one piano, we presented Arcadiana – a work for string quartet by the contemporary British composer Thomas Adès. In each of the work’s seven movements the composer “evokes an image associated with ideas of the idyll, vanishing, vanished or imaginary”. Today’s gift for the Twelve Days of Christmas is the work’s fifth movement entitled L’Embarquement – inspired by Watteau’s painting The Embarkation for the Island of Cythera in the Louvre. (The link is useful not only in enabling the listener to see the picture that inspired the music but also to read the Louvre’s commentary which sheds light on the playful nature of the music.) The players in this performance, which took place in the State Chamber on 30th August, were Jamie Campbell and Natalie Klouda (violins), Ruth Gibson (viola) and Nathaniel Boyd (cello). After only two years there are already many Southwell Music Festival performances that will live long in the memory: Andrew Foster-Williams’ impersonation of the prophet Elijah in Mendelssohn’s great oratorio will undoubtedly be among them. In the Nottingham Post, William Ruff described Mr Foster-Williams as “an electrifying (and sometimes terrifying) Elijah who sang entirely from memory and who brought operatic passion to every aspect of his role”. Elijah, performed in Southwell Minster on Saturday 29th August, was the central work at the 2015 Festival and today’s extract demonstrates all the qualities William Ruff mentioned to full effect. The conductor was Festival Founder and Artistic Director Marcus Farnsworth. For a musical equivalent of Alka-Seltzer (other brands are available) it’s hard to beat the effervescence of neo-classical Stravinsky. Today’s highlight from the 2015 Southwell Music Festival for the Twelve Days of Christmas is the first movement of Stravinsky’s Octet for Wind Instruments. This performance opened the Brave Horizons programme in the State Chamber on Sunday 30th August. While the Festival’s late night choral concert highlights the brilliance of our visiting singers, these chamber music programmes show off the talent among visiting instrumentalists and here it is the turn of our wind and brass players – conducted by Matthew Gee, more usually encountered as Principal Trombone of the Royal Philharmonic Orchestra and Aurora Orchestra. The 2015 Festival featured the music of Stravinsky extensively – not only the Octet and the performance of The Rite of Spring in his piano duet arrangement later in the same concert but also his Mass which was performed in its liturgical setting at the Festival Eucharist. 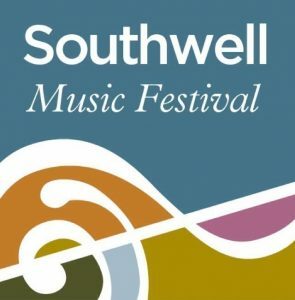 The lunchtime recital on Festival Saturday is the place where the Southwell Music Festival showcases emerging musical talent with Nottinghamshire connections. In 2015 we were delighted to present a recital by the immensely gifted pianist Julian Clef. Julian Clef was born in India in 1990 and began studying the piano at the age of five. At the age of 14 he was ‘spotted’ by Mrs Linda John from Nottinghamshire who recognised his exceptional talent. In 2005 he visited Chetham’s School of Music in Manchester who immediately offered him a place. He continued his studies at the Royal Northern College of Music and is now studying at the Guildhall School of Music and Drama in London. Today’s highlight from the 2015 Festival for the Twelve Days of Christmas is three of the Preludes by Alexander Scriabin with which Julian opened his recital. The quality and commitment of our visiting musicians is at the heart of making the Southwell Music Festival such a special experience. The late night choral concert in the Quire has quickly established itself as a showcase for the wonderful singers who come together as the Southwell Festival Voices. Another delightful aspect of the Festival is the chance to experience the stillness of Southwell Minster late at night. In today’s highlight from the 2015 Festival – from our Voices on Water programme on Thursday 27th August conducted by Artistic Director Marcus Farnsworth – the special qualities of singers and building come together. This magical setting of Caliban’s famous speech from Shakespeare’s The Tempest – ‘The isle is full of noises’ – is from Richard Rodney Bennett’s work Sea Change. The full orchestral version of Stravinsky’s ground-breaking ballet score The Rite of Spring is familiar enough but the composer’s own arrangement for four hands at one piano is much less familiar. So it was good to give it an outing in the 2015 Southwell Music Festival as part of our Brave Horizons programme in the State Chamber on Sunday 30th August. It was also a chance to put the Festival’s outstanding house pianists James Baillieu and Libby Burgess, more often heard in accompanying roles, centre stage. "Outstanding choice of music - a rich variety. The quality of the performances was amazing - what a treat for little Southwell!" "So good to have different venues which all seemed so well kept and run." "It was lovely to hear fresh young voices in the choir. I thought the quality of the performance was exceptionally good from the orchestra to soloists. The dynamics and interpretation of the Creation was excellent." "Aren't we lucky to have such great venues within easy reach of each other?" "Friday in the Old Theatre Deli stage area was a very special night. Thanks for arranging this extra concert." "The Minster is an ideal base for the Festival. Great atmosphere and imaginative use of the space. State Chamber ideal for smaller scale recitals. Old Theatre has an enjoyable intimacy." "We have been privileged to hear an outstanding quality of music. The musicians, singers and soloists have given great pleasure to those who heard them. The whole weekend has been an opportunity to experience a variety of music performance. The standard has been first class." 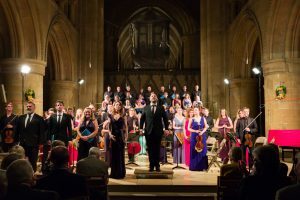 “Anyone who doubted that conductor and Artistic Director Marcus Farnsworth could possibly work such magic again must now feel certain that his supremely high standards of music-making are to be the hallmark of the Southwell Music Festival for the foreseeable future." "The performances were all outstanding. I doubt if you could hear anything any better anywhere. The programmes were varied and interesting." "A good choice of excellent but unusual music in both concerts attended, and excellent standards of performance by both musicians and singers." "Old Theatre Deli was absolutely spellbinding, intimate and of international quality. Haydn Creation in the Minster was amazing and of such high quality." "... a community event of an astoundingly high standard"
"Excellent choice of programmes. It was very good to hear live performances from such talented young musicians. Particularly impressed by the way the Sung Eucharist was not so much a 'performance' as an integral part of the liturgy." "The eyes of the musical world now need to be directed towards Southwell in August." "Excellent contributions from relatively young, energetic committed professionals. Good choice theme(s) - worked well. State Chamber has intimacy and impact." "...Southwell can already equal, even surpass, more established festivals." "Exceptional! Many of the performances were beyond words. It was a privilege to be part of this inaugural festival. Well done to Marcus, the artistes and to the organising committee." "The choir and orchestra were excellent. The soloists were inspirational and the interpretation of the music was masterful." "Energetic! Good choice of madrigals and music generally. Young performers who enjoyed it as much as the audiences"
"I must congratulate you on a faultless programme of events and of apparently seamless planning. I wish we'd been free to attend more events and will do so next year and all future years. Well done indeed!" I must congratulate you on a faultless programme of events and of apparently seamless planning.